The W-positions is one of many sitting positions that most children move into and out of while playing, but it’s a four-letter word to some parents. Why is it presumed to be ok for some children and forbidden for others? When playing in these other sitting postures, children develop the trunk control and rotation necessary for midline crossing (reaching across the body) and separation of the two sides of the body. These skills are needed for a child to develop refined motor skills and hand dominance. W-sitting is not recommended for anyone. Many typically developing children do move through this position during play, but all parents should be aware that the excessive use of this position during the growing years can lead to future orthopedic problems. Why do children W-sit? Every child needs to play and children who are challenged motorically like to play as much as anybody. They don’t want to worry about keeping their balance when they’re concentrating on a toy. Children who are frequent W-sitters often rely on this position for added trunk and hip stability to allow easier toy manipulation and play. When in the W-position, a child is planted in place or “fixed” through the trunk. This allows for play with toys in front, but does not permit trunk rotation and lateral weight shifts (twisting and turning to reach toys on either side). Trunk rotation and weight shifts over one side allow a child to maintain balance while running outside or playing on the playground and are necessary for crossing the midline while writing and doing table top activities. It’s easy to see why this position appeals to so many children, but continued reliance on W-sitting can prevent a child from developing more mature movement patterns necessary for higher-level skills. There are orthopedic concerns. 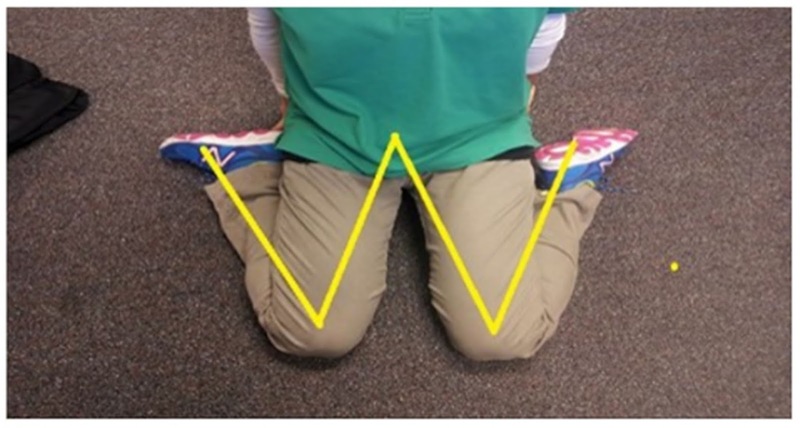 W-sitting can predispose a child to hip dislocation, so if there is a history of hip dysplasia, or a concern has been raised in the past, this position should be avoided. If there is muscle tightness, W-sitting will aggravate it. This position places the hamstrings, hip adductors, internal rotators and heel cords in an extremely shortened range. If a child is prone to tightness or contractures, encourage anther pattern of sitting. There are neurological concerns/developmental delays. If a child has increased muscle tone (hypertonia, spasticity), W-sitting will feed into the abnormal patterns of movement trying to be avoided (by direction of the child’s therapist). Using other sitting postures will aid in the development of more desirable movement patterns. W-sitting can also discourage a child from developing a hand preference. Because no trunk rotation can take place when W-sitting, a child is less inclined to reach across the body and instead picks up objects on the right with the right hand, and those placed to the left with the left hand. Try sitting in various positions. Notice how you got there, got out, and what it took to balance. 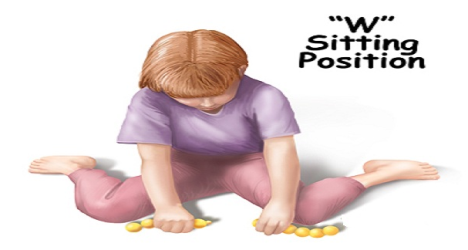 Many of the movement components you are trying to encourage in a child are used when getting in and out of sitting. 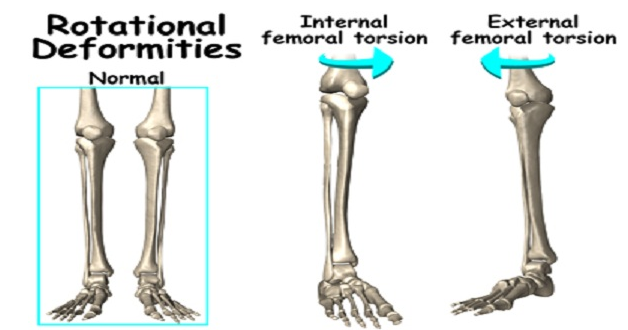 Transfers in and out of the Q-position, however, are accomplished through straight-plane (directly forward and backward) movement only. No trunk rotation, weight shifting, or righting reactions are necessary to assume or maintain W-sitting. How to prevent W-sitting. The most effective (and easiest) way to prevent a problem with W-sitting is to prevent it from becoming a habit it the first place. Anticipate and catch it before the child even learns to W-sit. Children should be placed and taught to assume alternative sitting positions. If a child discovers W-sitting anyway, help him to move to another sitting position, or say, “Fix your legs.” It’s very important to be as consistent as possible. When playing with a child on the floor, hold his knees and feet together when kneeling or creeping on hands and knees. It will be impossible to get into a W-position from there. The child will either sit to one side, or sit back on his feet; he can then be helped to sit over to one side from there (try to encourage sitting over both the right and left sides). These patterns demand a certain amount of trunk rotation and lateral weight shift and should fit with a child’s therapy goals. If a child is unable to sit alone in any position other than a W, talk with a therapist about supportive seating or alternative positions such as prone and side lying. Tailor sitting against the couch may be one alternative; a small table and chair is another.